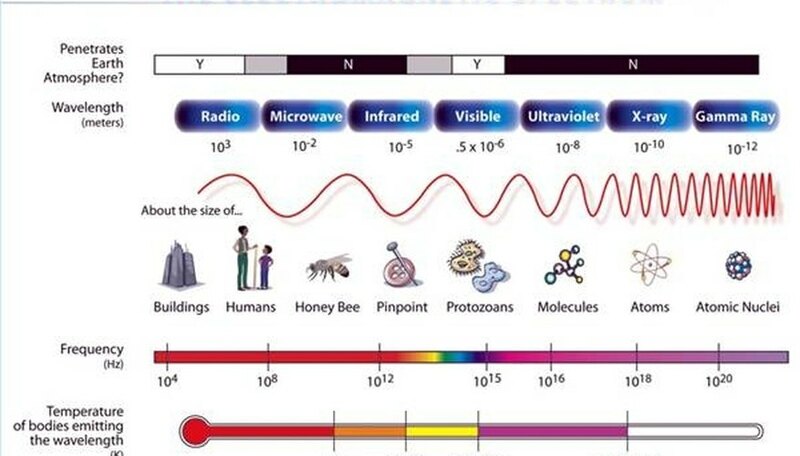 Light is measured in many units. Its wavelength, λ, is measured in both ...ngstroms and nanometers. Its frequency is measured in Hertz. Its energy is usually measured in electron-volts (eV), since Joules are too large to be practical. Its red-shift is measured in either short-distance units (if measuring the shift in the emission lines on the spectrograph) or in velocity units, from how fast the object is receeding. The wave nature of light can be exhibited by letting monochromatic (of only one wavelength) light through two very close pinholes (or equivalently through a diffraction grating). The light from the two pinholes interfere with each other, creating a pattern of bright and dark lines on a distant wall, revealing the wave character of the light. This same cancellation and augmenting pattern can be seen in water waves created by two nearby bobs. The peaks cancel out the troughs of the waves, while peaks reinforce peaks. From the measure of the patterns and the distance between the slits, an equation called the Rayleigh criterion can determine the wavelength of the light waves. To calculate higher energies, such as for X-rays, crystal diffraction is used instead of gratings. The X-rays reflect off a crystal lattice, e.g., NaCl, and form interference patterns as well. The energy of a photon is related to its frequency and--since c = λν--to its wavelength. 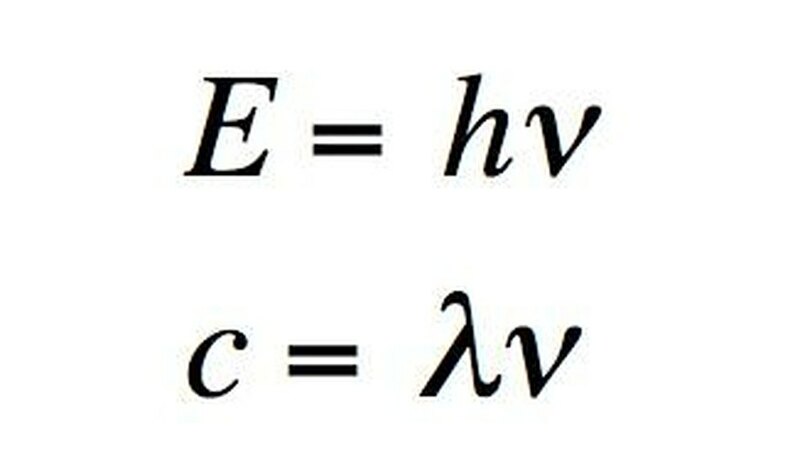 The relation is E = hν, where h is Planck's constant. The unit usually used for photons' energy is the electron-volt (eV). An electron-volt is the change in kinetic energy of an electron moving from a place where the voltage potential is V to a place where it is V+1. Gamma rays have energy of about one million eV. On the opposite end of the spectrum, radio waves have energy of a millionth to billionth of an eV. 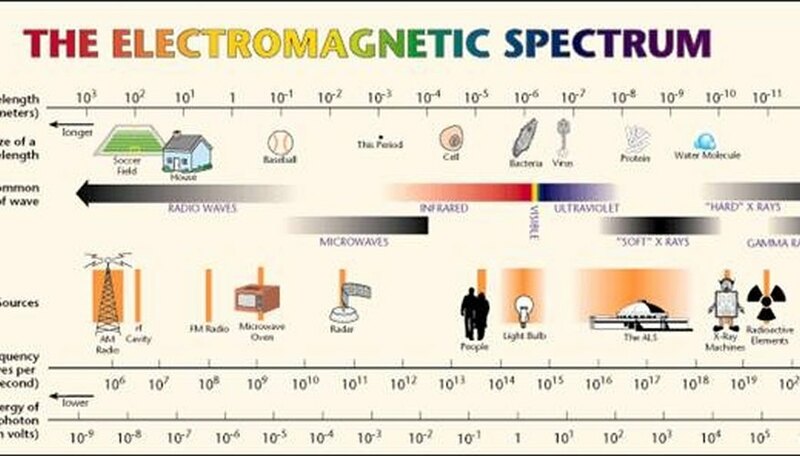 The visible spectrum is in between, at around five eV. Special relativity dictates that the light from a speeding object still appears to travel at the universal constant c, even for an object receding as fast as galaxies do. The theory goes on to dictate that wavelength does change, shortening by a proportion determined by the speed of the object relative to the observer. The lengthening is observable in the receding object's spectrum. Specifically, the emission lines of the light-absorbing and light-emitting gas of the object shift toward the longer-wavelength end of the spectrum. The light shift can be measured off the spectograph in terms of the absolute change of wavelength, i.e. in nm or .... Or the spectroscopic shift can be converted into the speed of the receeding object, and measured either in kilometers per second, or (because on a galactic scale, speeds are so high) as a proportion of the speed of light, e.g., 0.5c. Dohrman, Paul. "What Is Light Measured In?" Sciencing, https://sciencing.com/light-measured-5341424.html. 24 April 2017.